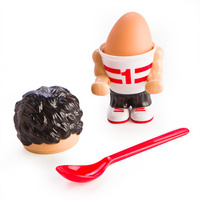 Runny Egg Cup Set | Eat breakfast like a champion! Eat breakfast like a champion! A satisfying breakfast is important to fuel your body for a busy day of running around! 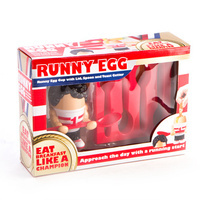 So approach your day with a running start and let this muscly little runner help you keep your eggs warm! Decked out in his "Number 1" running gear and holding your spoon as a weight, your runner will motivate you to tackle whatever comes your way throughout the day. 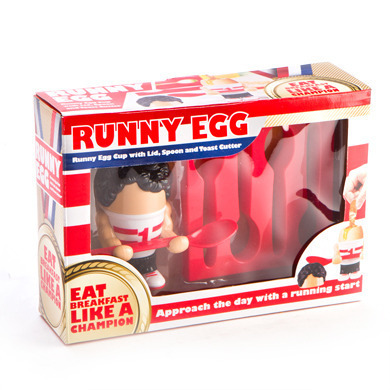 Lift his wig to reveal your "Runny Egg" and dip your toast! Contains: 1 x Runny Egg Cup with Lid, 1 x Spoon and 1 x Toast Cutter. Dimensions of egg cup with lid: 6cm (l) x 6cm (w) x 10.5cm (h). Dimensions of toast cutter: 12.5cm long x 1.5cm (w) x 12.5cm (h). Not dishwasher safe. Clean with a damp cloth and dry after eating.